A few years ago I interviewed a number of UN negotiators who had brokered and implemented peace deals, and all acknowledged that one of their regrets was not paying sufficient attention to the economic dimension, believing that it could wait until later. It couldn’t; the promises of these peace deals were not adequately financed. Young men had no jobs to provide an alternative to crime and bearing arms, and instead a criminal economy festered. Other countries confronted by conflict and post-conflict rebuilding can potentially bring some relevant lessons for Syria. In Syria, there is a risk that a much-needed humanitarian focus without consideration of economics can distort politics and economics such as to delay a return to normality, and create the very conditions for renewed conflict. In the near term, before any formal process of re-establishing order and commencing reconstruction, there are economic factors to consider: how can existing agricultural and food supply system keep functioning to ensure provisions for the citizenry? Are there market mechanisms, especially using businesses in the region, which can make the humanitarian system more responsive? What system of financial management should govern resources provided to the opposition? In many cases, a Trust Fund has proven indispensible in providing transparency and accountability in use of resources, enhancing trust of both citizens and donors. For the longer term, as and when a process of reconstruction is reached, an order of priorities needs to be established. Attending to the protection of the population and critical infrastructure, and working out a political process are the highest priority concerns. Maintaining or re-establishing essential services including medical care, food and water supply, are required to save lives. Yet economic and financial factors underlie these: ensuring that front line civil servants are paid requires a payroll system to function. Distribution of essential goods requires an economic and administrative network, where market mechanisms underlie the supply chain, and local councils and administrative units effectively distribute and adjudicate humanitarian assistance. Keeping water clean and electricity flowing requires financing to be in place. Underwriting livelihoods of the population can be met at scale through jobs programs: the current real unemployment rate is assessed at 20%. The very process of rebuilding can help rally a population around a common purpose. And the trust in any political leadership or process requires accountability for resources. What are the economic factors that will require attention? First, accountability in the use of funds will set the foundations for legitimacy and trust for a new administration. A Trust Fund and clear budgets that have agreement of relevant groups can help establish the rules, checks and balances right from the start, and help head off mistrust and blame games later down the road. The key is to balance the flexibility required to enable speed of response with sufficient accountability to ensure checks and balances. Where Trust Funds have succeeded, they have made clear decisions, streamlined processes, and good management and programming capability. Where these factors have not been secured, Trust Funds have failed. In many cases, a rapidly established reconstruction agency staffed with the engineers, program managers and accountants necessary to manage a large-scale reconstruction effort has helped secure the relevant capacity and ensure the right processes are in place. But care has to be taken that they do not become a ‘super-agency’ that gathers too much capability and resources vis-à-vis the rest of government. Second, programs that both work at scale and can ensure decisions are decentralized are essential to managing reconstruction. Where reconstruction processes have failed is when there are thousands of isolated projects, the very design of which create a “coordination” conundrum that fragments authority and legitimacy. The design of a number of key programs can ensure an even-handed approach across the country, within which projects can be gathered in a portfolio approach. Third, a fairly early priority should be to restore Syria’s capability to generate its own revenue. Prior to the conflict, Syria’s national revenues were over $10 billion a year, based on agriculture, industrial production and oil production. Once sanctions can be lifted, the sooner the revenue base can be rebuilt, the sooner Syria will be independent from foreign dependency, and secured of financing in a world where many donor contributors are under severe budgetary constraints. Revenue also provides an indicator of key industries being established, which themselves will help restore key services including food and fuel supply, and regenerate the jobs that will underwrite livelihoods. Fourth, many externally driven reconstruction processes operate on the basis of ‘needs assessments’ which tally the needs and gaps in the society. Understanding the extensive damage to the physical and social fabric is certainly essential. However, this needs to be balanced with an understanding of the ‘assets’ that are already in place within Syria. Unlike many other countries that have faced the need to rebuild after war, Syria has a highly educated population – with engineers, accountants, and managers in abundance. Therefore Syria will not require a heavy presence of foreigners to substitute for these skill sets. Similarly, Syrian communities have demonstrated substantial capability for self-management and governance, and are set to play a significant role in managing reconstruction and restoration of services across the country. The many individuals and groups in civil society that played and continue to play a role in articulating a future citizenship-based Syria have earned a space which will need to be carefully guarded. Existing Syrian businesses have capability and new ones can be created, ensuring the opportunity for young men and women to have jobs and ownership stakes in the process of reconstruction. 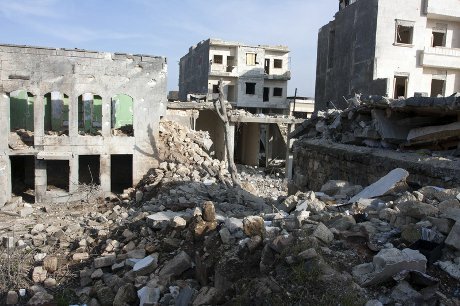 And most of all, Syrian citizens must be engaged and empowered in any process to participate actively as agents in the process of rebuilding their own society, since reconstruction processes that have treated the population as passive ‘beneficiaries’ of an effort managed by outsiders have often resulted in marginalization and even insurgency. Agriculture, manufacturing, construction and services will all play a key role in increasing both jobs and revenue. Much attention is paid to the dollar figure on contributions of funding for reconstruction. While funding is necessary, this obscures that many of the real resources are already within the society – the human, physical, natural and social capital – and that the way to capitalize or release these resources for the benefit of the citizenry are through the design of rules and organizations to manage these assets. Fifth, discussion needs to focus on the conditions for a legitimate economy. During war, provisioning networks create opportunities for transactions outside the rule of law that can set the basis for the criminalization of the economy. Careful attention needs to be paid to the extent to which the economy has become criminalized or informal, and how to reopen the space for legitimate business. Finally, like the state, the market is just a mechanism, blind to winners and losers. Public policy will have a significant role to play in whether the economy becomes more inclusive of the citizenry at large and certain groups in particular, to mitigate historical patterns of exclusion and prevent new patterns of exclusion emerging through the right rules of the game. The way policies are set and resources are allocated will play a significant role in whether trust can be established, or whether grievances fester. Attention to ensuring a livable wage and work with dignity for the citizenry should be a critical priority. It may seem out of place to talk about economics while the conflict is still raging, yet the longer the conflict goes on the more important it becomes to address economics as one of the means out of that conflict. The young men who have taken up arms on either side of the conflict will have no incentive to lay them down again, even when the initial peace comes, if there is no other work for them to do. It was lack of economic opportunity, after all, that was a major underlying driver of the Arab Spring uprisings in the first place. If the next Syrian government does not resolve the economic opportunity conundrum, it may be short-lived indeed.